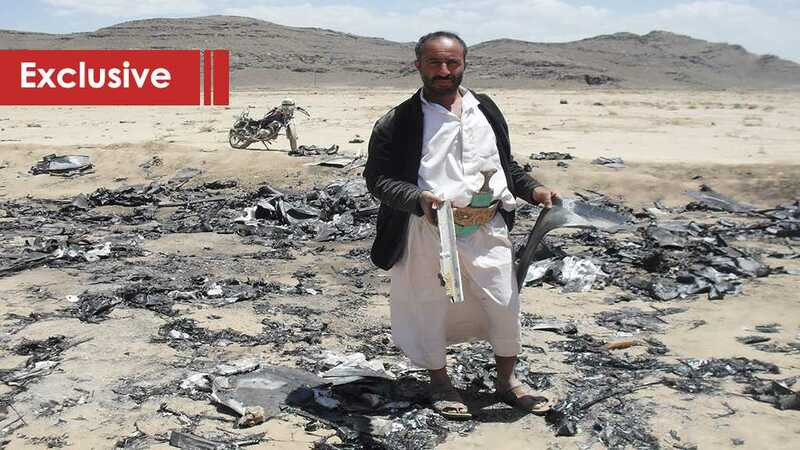 Sana’a – Villagers are seen looking at the remains of the US Made MQ-1 Predator Drone that was shot down by Yemen’s Air Defense Force on Friday, in images that have been circulated on social media. Al-Ahed News, on Saturday morning, visited the shoot down scene in the aftermath of downing MQ-1 which US has not confirmed or denied the shooting yet. Mohammed Saleh, resident of Hamdan district who lives in a village about 5 km western of the scene said the shooting down took place at about 10:30 p.m. on Friday. “I just arrived home from my farm on watering ‘khat’ mission. As I entered home, suddenly I heard an explosion,” Saleh told al-Ahed News. “I went up to the rooftop. I saw a fire at this place,” Saleh added while speaking at the shooting down site. Saleh who is a father of seven children said he used to hear aircrafts overflying over Sana’s during the past months. “I hope to sleep this night [Saturday’s evening] without hearing overflying of reconnaissance drones,” said Saleh upon our arrival at his village “Mdam” in a mission of looking for another eyewitness to speak to our website. Fuad Mahdi, in his early twenties, is a resident of “Mdam” village of Hamdan district of Sana’a Governorate where the US MQ-1 Predator Drone downed. Mahdi says he was at the door of his house during the explosion of the missile that hit the US drown. Mahdi spoke to al-Ahed News while sitting near his pick-up truck that is loaded with Khat. Fuad Mahdi, left, sits near his pick-up truck near his house in the village so close the scene of shooting the MQ-1 Predator Drone in Hamdan district of Sana’a- Saturday, March 23, 2019 (al-Ahed News). “I was sitting at the door of my home,” Mahdi said. “At first I saw a light, then heard an explosion,” Mahdi noted. “Then I saw fire [on the ground] and people gathered to see,” Mahdi added. Mahdi says he then decided to go to the scene of the fire on foot, then a car of one of the villager followed him and they reached the shoot down scene together. “It was something big,” Mahdi said with a smile on his face while expressing how he feels on this achievement of the Yemeni Air Defense Force. Tueller said in Aden that Sana’a Authorities’ (Ansarullah) weapons “pose a threat to other countries in the region”. The United States has not yet commented on this incident. But after Ansarullah media released footages of the MQ-1 Predator Drone on fire, the Saudi-led coalition warplanes kept overflying over Sana’a ahead of carrying out a string of airstrikes on Al Dailami Airbase and military camp on the outskirts of Sana’a. It is said that the MQ-1 Predator Drone is an American remotely-piloted aircraft built by General Atomics that was used primarily by the US air force and Central Intelligence Agency. Air Defense Force was able to shoot down the Predator Drone after taking precautions that it will land in a place far from populated neighborhoods. Unlike what Saudi Arabia air defenses do when shooting down Yemeni missiles or drones where they shoot them while on civilians’ houses to harm them and then blame Yemen’s army of targeting populated areas. Abu Abdullah Al Sheikh, Top ranking official at the Popular Committees of Hamdan district, denied that the US has neglected the shoot down of the MQ-1 over Sana’a. 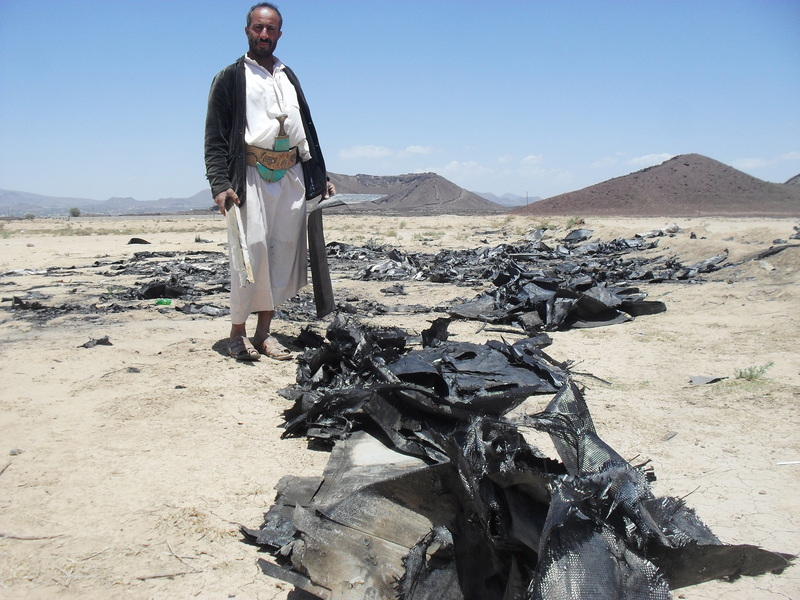 “The US didn’t neglect the shooting of its drone [MQ-1 Predator Drone], but it immediately responded by more than two warplanes that were overflying over Sana’a in less than an hour after downing it,” Al Sheikh told al-Ahed News. “Overflying continued until the dawn [of Saturday] morning” he added. “US has not officially commented because it wanted to show for the world that it is still powerful,” Al Sheikh said. He thinks the US is now looking for a peaceful solution in Yemen to ensure a safe-out of the war. “We have launched entering the fifth consecutive year of resisting the aggression with downing MQ-1 Predator Drone,” Al Sheikh said. “We will down all of their (aggressors) aircrafts. This is a clear message to US, ‘Israel’, and UK that we will shoot down all of their air properties.” He added.